Learn from the Millennial Expert Herself! You have three options when it comes to Millennials. Companies that actively adapt to today’s multigenerational workforce have higher levels of productivity, significantly lower attrition, and exploding workplace happiness. There are billions of dollars in profit to be made for companies who choose to embrace Millennials. They are already the biggest generation in the workforce and in just a few years will have the main buying power of any generation. But here it is: Most companies are completely clueless (and you may be too!) when trying to relate to Millennials. What worked in the past won’t work with them. Old-school marketing (billboards, banner ads, and bumper stickers) is useless. Millennials want to engage with your product on social media. Traditional hiring (job boards, career fairs, and advertisements) wastes time and money. Millennials expect virtual walk-throughs and personal engagement from the start. Members of this generation don’t care about how much money you make. They care about the difference you make. You already know this. Millennials are a VERY different generation to work with. They are glued to their smart phone. They text you back when you call. They expect raises and promotions faster than you can give them. But they are also the most tech-progressive and creative generation, revolutionizing industries around the world. They bring the knowledge it takes to maximize profits and revolutionize your company. They possess the perfect blend of technology adaptation, attitude, and education that will have you and your team excited to show up each and every day. Don’t let your competition get to them first. It could put you years (and millions) behind. This new generation of talent is coming onto the scene with incredible creativity, innovation, and insights. This is the generation that has been raised with knowledge of leading technologies. It’s ingrained in them. THEY are the ones who can use their knowledge to make YOUR business stand out. Yes, I want to Tap the Next Generation of Talent! Send me Gabrielle Bosché’s new program The Millennial Solution. We aren’t even halfway through the Millennial hiring blitz. We still have decades more of hiring this generation! But how can you harness, mold, and deploy Millennials’ power? How can YOU bring the RIGHT combination of talents to YOUR business? This Millennial Generation gets a bad rap. Millennials are considered either entitled, disloyal, unmotivated, or addicted to technology (or all of the above!). The seed of frustration is misunderstanding. 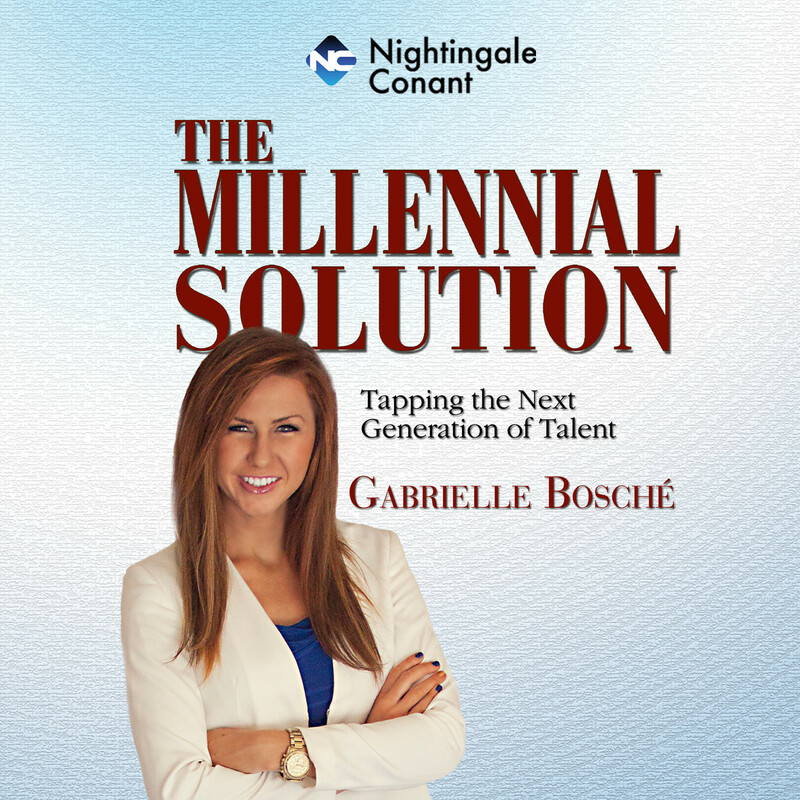 Gabrielle Bosché is the only Millennial expert who IS a Millennial. She has spent nearly 10 years researching and aggregating best practices for you to manage and motivate her generation. With Gabrielle as your guide, you’ll build a dynamic, innovative, and profit-building team… a team that has become internally motivated, infused with energy, and ready to sky-rocket your business’s goals. Stop feeling as if you are playing catch-up. Get in front of the curve. Get the edge your company needs to quickly access and motivate to action the unique Millennial skill set. While other organizations are “going back to the drawing board” time and time again to try to fix what’s broken, you’ll be moving, shaking, and catapulting past your competition with a workforce that has the unique talents to bring you profits, sustainability through changes, and a bright future ahead. Let’s face facts. How confident are you in your company’s use and mastery of technology? If a Millennial were to visit your site now, would they say, WOW! Would they know your values? Would they be inspired by your mission? If not… you’re not properly leveraging the tech advantages available today. You are at HIGH risk of being left behind. The Baby Boomer Generation is retiring… or at least getting ready to. We believe there has never been a more crucial time to understand and gauge the NEW talent that is needed to replace them. The tide is turning, and by implementing Gabrielle’s principles, you’ll bring in the future success of your company. In each power-packed session, Gabrielle shares battle-tested stories and techniques so you can bring together the best talents and skills from ALL generations, uniquely understanding the Millennials’ role to have maximum impact in any endeavor your team pursues. If you are a manager, entrepreneur, parent, or team builder of any kind, you need to gain an understanding of the Millennial Mindset. Regardless if Millennials become your employees, peers, community group, or customers, you cannot ignore the power they possess. With Gabrielle Bosché’s The Millennial Solution, you will grasp the unique needs, talents, and lifestyle of this influential generation. Never has there been a more exciting time in business, and Gabrielle Bosché gives you the tools and techniques to create a team that is cohesive and unstoppable. Order this informative program now. It’s guaranteed to be full of profit-rich information, bringing opportunity to you and your business. P.S. Millennials WILL drive the future — get ready! I want to enrich my business by tapping this powerhouse group of Millennials. Please send me Gabrielle Bosché’s 6-CD and PDF-workbook program titled The Millennial Solution for just $69.95 which is 70% off the regular price of $234.95. Order Now, with this Special Limited-Time Offer! I understand by investing only $69.95, I’ll gain exponential benefits by learning and implementing Gabrielle’s strategies. If I don’t feel I get the benefits promised, I can return the program within 30 days for a refund of my purchase price. No questions asked. Click below to order RISK-FREE with our 30-Day Guarantee.